I've said it before, and I'll say it again, I love cheese. When I was growing up there were only a few choices, the ubiquitous orange, plastic-wrapped squares, maybe a slice of swiss, and grated Parmesan cheese. That was pretty much it. Thankfully, America's commercial cheese options have exploded over the last few decades, and now even modestly-sized grocery stores will have dozen of choices, including some artisan offerings. The wine and cheese pairing video below is from a new website, sponsored by Sargento, called the Artisan Cheese Center. They just added a link to this blog, and I have used a few of their recipes for my About.com American Food site. In the bad old days, a company like Sargento would have tried to prevent small artisan cheese makers from competing with them for store space. Today, with these handcrafted cheeses gaining a foothold in the market, Sargento has seen the wisdom of joining forces, and now features a series of what they call "Artisan Blends," produced cooperatively with these smaller cheese makers. Let's hope this trend continues! Oh yes, cheese has become a wonderfully versatile cooking choice with so many fantastic varieties! 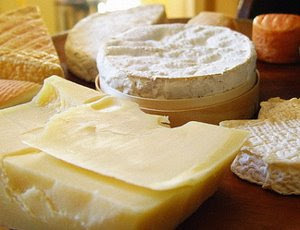 it's funny that cheese has flourished even during the low-fat craze. what would u recommend the best cheese for snacking, chef? Even Kraft is getting into the "green/gourmet/pure" thing by not using milk from hormone-injected cows. The nasty fake, plastic wrapped cheese is going away.... FINALLY! Got Crepes? Make Chicken Cannelloni!